This post is sponsored by Cost Plus World Market. All opinions are my own. Growing up in small town Minnesota, Indian food was not something you could find within 100 miles. Perhaps it was because we lacked any large Indian population, or any extensive knowledge of the culture, or international food in general, but either way, I was well into my 20’s when I finally tried it for the first time, like banana green smoothies and everything red velvet. 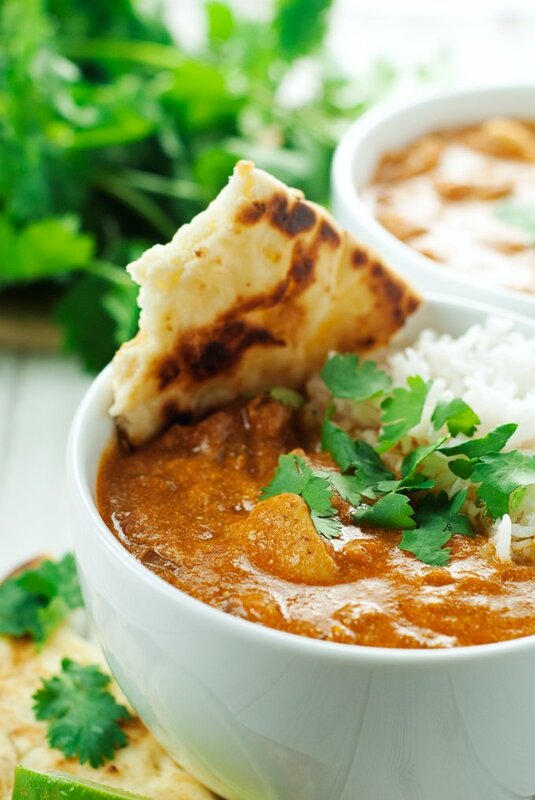 Chicken Tikka Masala was my first taste of Indian Cuisine, when my favorite Chinese restaurant closed and was replaced with an Indian restaurant run by a local Indian couple. To say I was nervous about trying Indian food is an understatement. I heard it was super spicy and the flavors were…weird. Looking at the menu, I had no idea what I was going to try, and since it was my family’s first time trying Indian food, they were at an equal loss on how to guide me. Thankfully, however, the owner was amazing and came to my rescue, bringing me a platter of Chicken Tikka Masala and quickly converting me to the wonderful world of Indian food. I don’t know why I was so scared, Indian food is amazing! 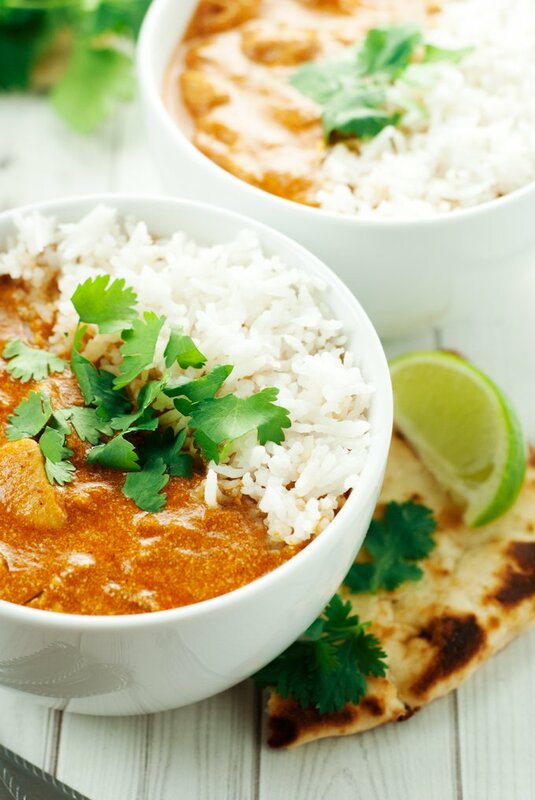 I wanted to share this amazingly easy Chicken Tikka Masala because I was inspired by The Second Best Exotic Marigold Hotel movie that is coming to theaters March 6! 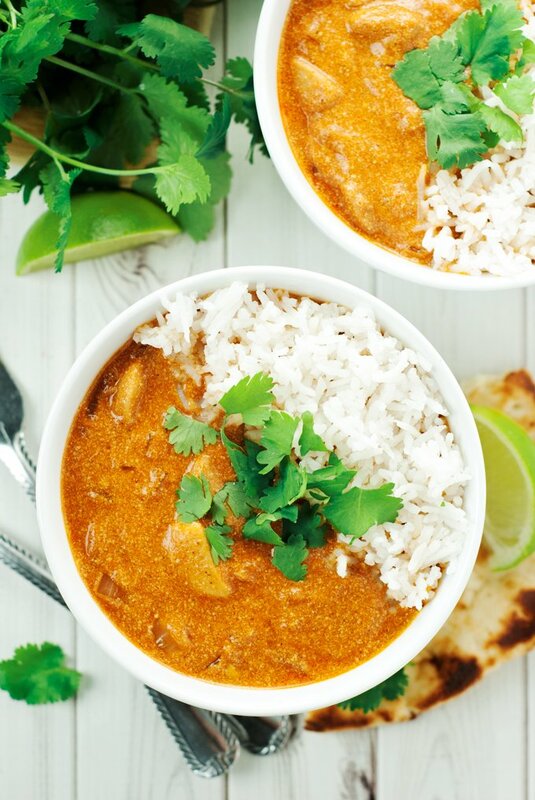 You can whip up this easy, lighter Chicken Tikka Masala in just 30 minutes, and the flavor is amazing! 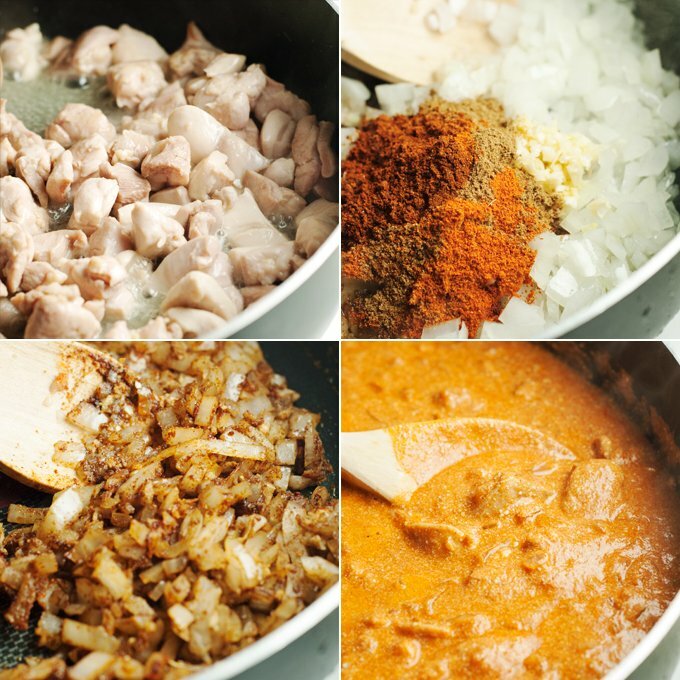 Starting with the essential seasonings like garam masala, cayenne pepper, and cumin, cook up some cubed chicken, onion, and garlic with coconut oil until softened. Add tomato sauce and coconut milk, then let simmer for 15 minutes. Serve with some deliciously fragrant Basmati rice and naan bread and you have yourself a deliciously amazing dinner on your hands! In a large skillet over medium high heat, add 2 tbsp of the coconut oil, followed by the cubed chicken. Brown the chicken thoroughly on each side, then transfer to a bowl. Add the last tbsp of coconut oil and melt, then add the onion and saute until softened, around 3 minutes. Add the garlic, ginger, and spices, stir into the onion thoroughly, then add the tomato sauce, cook for 2 minutes, then add the chicken and coconut milk, stir everything together, reduce heat to medium low, and allow to simmer for 10-15 minutes. Serve with a steaming side of Basmati rice, and garnish with fresh cilantro and a side of naan bread. YUM! This seriously looking delicious! Beyond words! Looks delicious Karly. I love the photos too. They look fantastic! Love that it's dairy free! Perfect! My husband (who was then my boyfriend) introduced me to Indian food in college. I did not want to go, but he insisted it was good. And it was! Indian food is one of my favorites even today, 20+ years later. 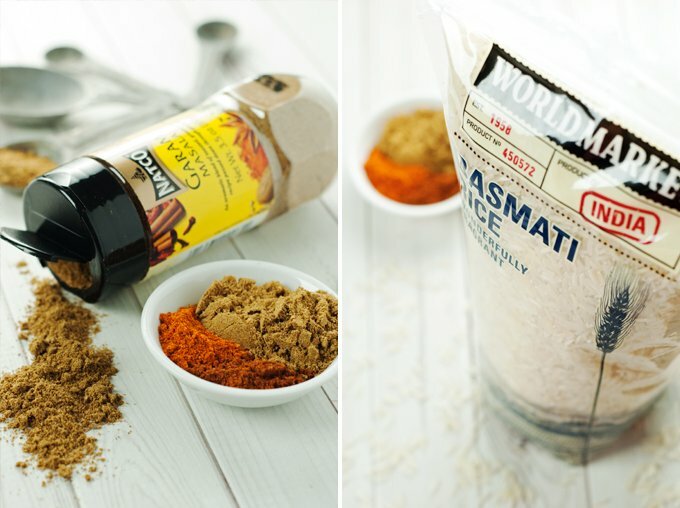 I love how easy this recipe is...I will definitely try it! Looks delish! 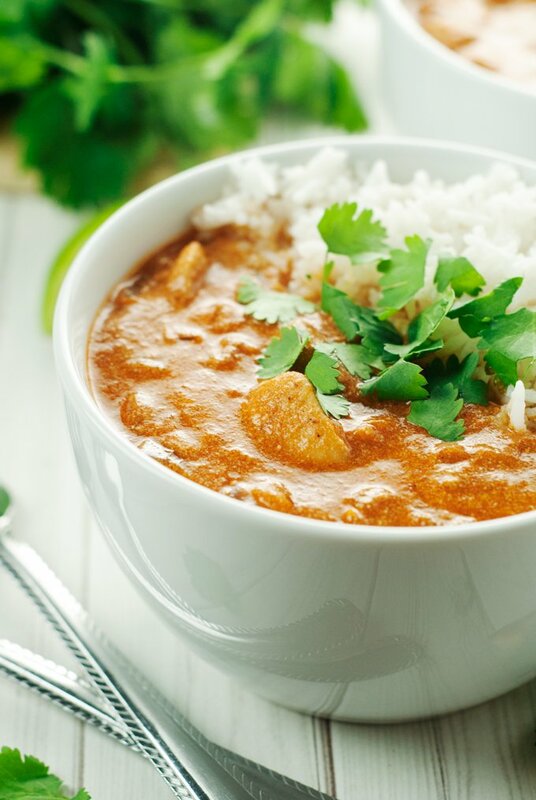 I love chicken tikka masala and we eat it often. Indian food is amazing and so flavorful. 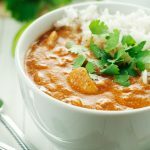 Was looking for an easy Indian curry recipe, most are complicated. Made it tonight. So good. Thanks! Hi Karly,Recipe looks awesome; I'm going to give it a try this weekend. My fiancé has a nut allergy and includes coconut. Is there anything I can use as a substitute? Thanks! Hi Shawn! You can use regular milk instead! I hope you enjoy it! Do u use sweetened or unsweetened coconut milk ? Is it possible to add potatoes and carrots to this curry?